Dunes jacket shop owner and property fanboy Jerry Pearman was given the honor of making the final throw of the dice before the property closed in 1993. Betting $5 on the pass line, he rolled a 7 and won. The Silverbird signage alone may have secured the win for this week's "Twitpic of the week", once again brought to you by @TonyIlliawho has recently been dominating the designation. I know it was a short lived incarnation for the property, originally known as the Thunderbird, but something about all the silver just captures my imagination. I'm curious how hot that sign got with the desert sun shinning down on it, and what sort of crazy reflections that thing created, and was the real concept behind the signage an overly elaborate way to torture and kill James Bond. The world may never know. 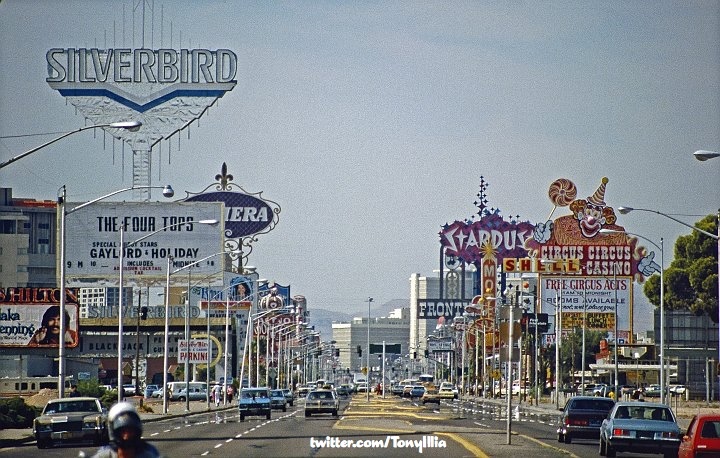 What we do know is that only two things in this picture still exist today on the Las Vegas strip, Caesars Palace and Circus Circus, interestingly enough, both themed resorts from the mind of Jay Sarno. And only one of them still looks like it did in 1981, that's the Lucky the Clown marquee at Circus Circus. Caesars Palace is shown here in the dead center of the photo, still sporting the Sarno block exterior it would keep for almost another 20 year before being changed to what we know it as today. Everything else, has literally been raised to ground and is currently undeveloped land. 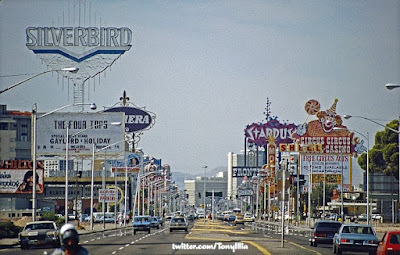 But don't lament its passing too much because what the picture doesn't show you, is that in 1981, the strip located south of Caesars looked very similar to what this part of the strip looks like today. 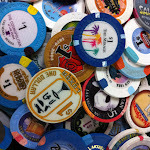 Paris, Planet Hollywood, Cosmopolitan, City Center, Monte Carlo, NYNY, MGM Grand and Luxor were little more than undeveloped land. I'm sure there's a metaphor in their somewhere but I'm too busy enjoying the view to wax philosophical.